As we can read in technewsdaily.com, the worlds longest stretch of high-speed railway opened in China last week (Dec. 26). The line is 1,200 miles long and the trains travels at an average of 186 mph. If we take a look back, using wikipedia, we recall that railways were the first form of mass transportation and had an effective monopoly until the development of the motorcar in the early 20th century. High-speed rail development started on 6 October 1903 : an electrical railcar from AEG and Siemens & Halske achieved 203 km/h (126 mph) on the military railway track between Marienfeld and Zossen in Germany, showwing that electric high-speed rail was possible. For scheduled trains, however, high speed rail travel was still more than 30 years later. The new trains run at an average of 300 kilometers per hour (186 mph)  a speed that makes cell phone connections unstable, Xinhua, Chinas state-run news agency, reported. A U.S. Amtrak trip between New York and Miami, a shorter distance than between Beijing and Guangzhou, takes almost 30 hours, the New York Times noted. The new rail may save China on fuel use and emissions by freeing older trains to carry freight between factories in the north and ports in the south. Such freight is currently shuttled by fuel-hungry trucks. 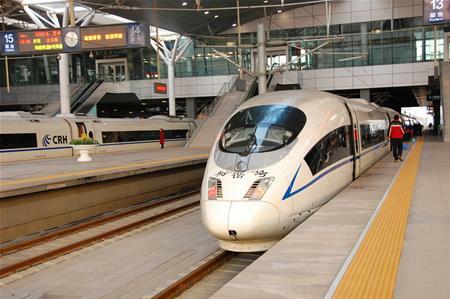 Other major southern cities the new line will connect to Beijing include Shenzhen and Hong Kong, which is an additional two-hour train ride from Guangzhou, Time reported. The line opening shows the Chinese governments continued dedication to building a countywide high-speed rail network, the New York Times and Wall Street Journal reported. The country already has about 5,800 miles (9,300 kilometers) of high-speed rail in operation and plans to have a total of 11,000 miles in place by 2015, Xinhua reported. Chinas high-speed network boosted the countrys economy during downturns in 2009 and this fall, the New York Times reported. But its also come with 4 trillion renminbi (about $640 billion) in debt. The technology has also sparked safety worries, especially after an accident in Wenzhou in southeastern China in 2011 killed 40 people. China lowered its bullet trains top speeds in response. The new speeds come at a price to customers, of course. A second-class ticket from Beijing to Ghangzhou costs 856 renminbi ($139). The same trip on an older train, on a hard sleeper seat, would cost about half as much. A plane ride between the two cities, which takes a little more than three hours, costs about $209, according to the Wall Street Journal.